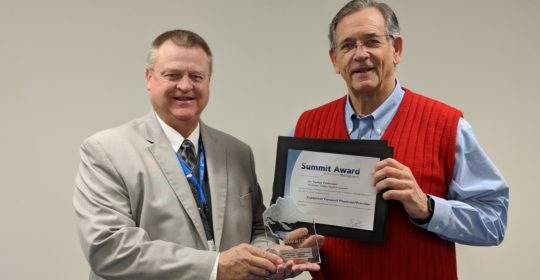 The Summit Award is the highest award of HealthCare Service Excellence presented by Custom Learning Systems. (www.customlearning.com) It is awarded to qualified, innovative, and progressive individuals, teams, and healthcare facilities who have made outstanding progress towards improving the patient experience and staff engagement. Individuals, teams, or organizations must be nominated to be eligible for a Summit Award. In 2017, there were over 265 nominations from 20 different healthcare organizations spanning 10 states. From the nominations, 54 were chosen as Pinnacle Achievers and 15 of those 54 were presented the Summit Award. The 2017 Summit Awards are presented by Custom Learning Systems during the annual HealthCare Service Excellence Conference. The HealthCare Service Excellence Conference is dedicated to delivering evidence-based solutions to help hospitals and other healthcare facilities across North America improve the overall patient experience. Congratulations to both of you! Well deserved!